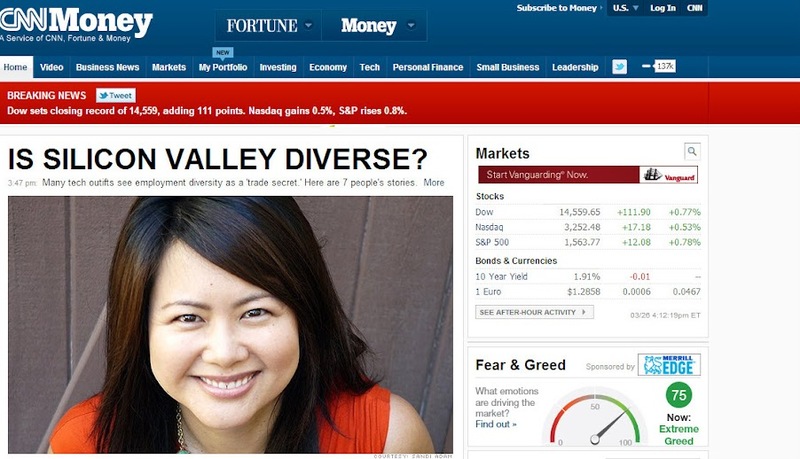 A couple of months ago I was in a story on CNNMoney which features a photo of me taken by my 9-year-old daughter. I’ve had experiences with a variety of photographers over time, from newspapers, fashion magazines to private studios — and the pictures that come out best are always the ones that my daughter takes. Maybe I’m just happiest and more natural when I’m with my family. The story was about diversity in the tech / startup sector, and I was interviewed based on my past experiences as a woman in the space, as a past startup founder and CEO and now as part of another venture-backed company. In my experience, the lack of diversity isn’t the result of overt and intentional discrimination — I’ve had numerous male mentors and advocates throughout my career — but a pipeline issue. To date, there have been fewer women than men who’ve pursued fields of study or expertise that might land them in the tech sector. Why does this matter? A lack of diversity hurts all around — in the venture capital world for instance, it can limit the type of investment and diversification of a portfolio — I saw this when I raised money years ago for a cosmetics venture. It can also reinforce stereotypes — the dearth of women in tech may make some believe that women aren’t capable of performing in that sector. I was raised in an Asian-American family where it was expected that I would perform in math, and I went to a high school for science and technology where we cloned violets as freshmen, so tech was never something that was ruled out for me — in a way, it was expected. I know that’s not the case everywhere, and it starts young. At my daughter’s school, some friends and I noticed that our daughters were saying that they weren’t good at math — even though they were getting As. This confidence issue isn’t uncommon. We’re lucky to be at a great school where, once she was aware of this, the teacher worked hard to correct this distorted perception — but it did take work. I’m hopeful that things are changing. I’ve seen more female VCs recently than I ever have. As a society, we’re more open-minded now about gender roles, more aware of early negative self-perceptions of girls in math, and there are clubs and organizations springing up that introduce girls to computer programming (which, by the way girls, is really fun!). Exposure to these types of disciplines helps build strong analytical thinking and problem-solving skills. We could all use some of that.